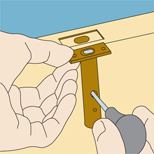 Summary: Learn how to install hinge and mortise door bolts, fit a hinge bolt and fit a mortise bolt. Hinge and mortise bolts are simple but effective ways of making your doors more secure. 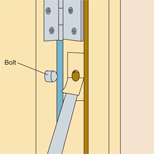 A minimum of two hinge bolts should be fitted to a door. One just above the lower hinge and the other just below the upper hinge. Read the manufacturer's instructions to determine the size of the drill bit needed. Mark the position of the hole on the door edge and drill the hole. Use a hammer to force the stem of the bolt into the hole, leaving the domed head of the bolt proud of the surface. Push the door closed until the bolt leaves a mark on the doorframe. Drill a hole for the bolt over this mark, using a bit the same diameter as the bolt head. 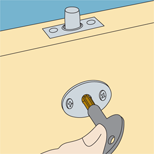 Place the plate on the doorframe ensuring it is aligned with the bolt and draw around it. To recess the plate, cut slits into the wood inside the marked area to the same depth as the plate. Then carefully chip the wood away using a hammer and chisel. With the recess for the plate finished, screw the bolt plate in place on the doorframe, and check that the door operates smoothly. Follow the same method to fit additional hinge bolts. Recess the plate by carefully chipping away the wood using a hammer and chisel. Choose a convenient height for the bolt on the door and mark this position on the edge of the door. At this position drill a hole for the bolt referring to the manufacturer's instructions for the correct depth. Insert the bolt into the hole and with the plate sitting proud of the surface draw around it. Remove the bolt from the hole. Chisel out enough wood from the outlined area to accommodate the plate so that it will fit flush with the door edge. This will be easier if you cut slits into the wood and carefully chip these away with a chisel. Hold the bolt against the interior of the door, parallel to the bolt hole on the edge of the door. Mark the position for the keyhole. Using a drill bit the same as the diameter of the keyhole, drill through the door until you reach the bolt hole. Replace the bolt and secure it with the screws provided. Screw the key cover plate in position. Test the mechanism by turning the key in the lock. 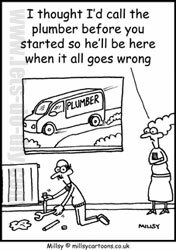 If working properly the bolt should leave a mark on the doorframe. This is where you should drill a hole to the correct depth to take the bolt. Finally fix the strike plate over the drilled hole in the doorframe. The strike plate can be recessed into the frame following the same method used for fixing the bolt plate. Holding the bolt against the interior of the door, mark the position for the keyhole. Test the mechanism by turning the key in the lock.